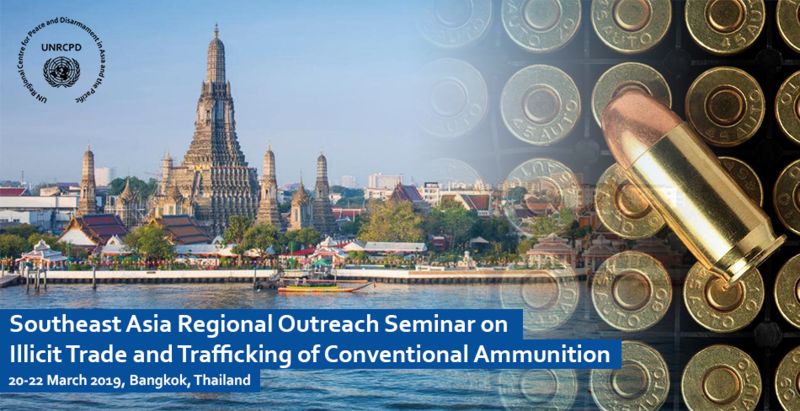 As part of its region-wide initiative to support States with the safe and secure management of conventional ammunition, the United Nations Regional Centre for Peace and Disarmament in Asia and the Pacific organized the Southeast Asia Regional Outreach Seminar on Trade and Trafficking of Illicit Conventional Ammunition, in Bangkok, Thailand, from 20-22 March 2019. In response to the challenges posed by unsecured or poorly managed national ammunition stockpiles, the Seminar fostered regional dialogue between Southeast Asian States on matters of conventional ammunition, and provided a forum to share practices and engage with experts on how to address these challenges. Participants examined current regional trends of illicit trafficking of ammunition, as well as effective practices and further steps to address related risks and challenges to regional security. The Seminar also strengthened regional cooperation and coordination between national law-enforcement agencies and regional entities dealing with such matters. The presentations and discussions incorporated a range of perspectives, and tools like the International Ammunition Technical Guidelines and the UN SaferGuard platform, and examined the implications of diversion and illicit trafficking on safety and security, as well as possible joint responses and synergies between global frameworks and instruments. The Seminar further allocated a whole day to support the work of an upcoming United Nations group of governmental experts on problems arising from the accumulation of conventional ammunition in surplus, to be convened in 2020 in accordance with UN General Assembly resolution 72/55. The Seminar is a contribution to the implementation of the Secretary General’s Disarmament Agenda, “Securing Our Common Future,” specifically on realizing Action 22 on securing excessive and poorly maintained stockpiles. The Seminar also promoted the 2030 Agenda for Sustainable Development, particularly Goal 16 on peace, justice and strong institutions. The Seminar was made possible with financial support from the Government of Germany. For further information, please contact Yuriy Kryvonos, Director of the United Nations Regional Centre for Peace and Disarmament in Asia and the Pacific, via e-mail at info@unrcpd.org.